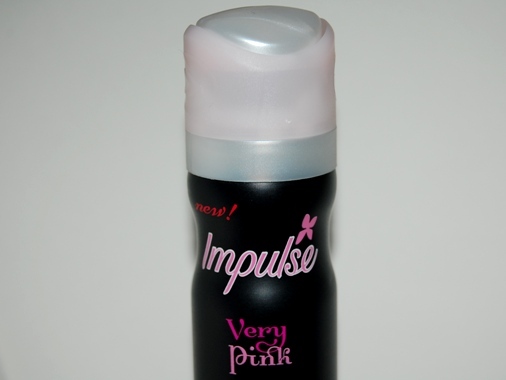 I was recently contacted by Impulse about trying one of their latest fragrances 'Very Pink.' So when it turned up in the post (as a pr sample), this is what I found! With an undeniably pretty pink heart motif, this 75ml fragrance is sweet, but not overpoweringly so. In fact, while this fragrance does contain vanilla, I find that the citrus notes of the pink grapefruit notes are clear from the second you spray it and lovely. They compliment each other really well as the vanilla just takes the sharper edge off of the fruitiness. While it does have some, it's not too heavy with musk and is quite light, if musk isn't your thing. What I really love is the thoughtful addition of the easy to seal twisting lid, which allows you to carry it around wherever you need without fear of it leaking. I regularly throw my makeup and beauty products in the bottom of bags and suitcases so this is a great reassurance! This has meant that I've taken it with me to work several times this week. Although it wears off after a couple hours of lugging book trolleys around, I still think that this fragrance is great for everyday wear and I love the pink grapefruit in it! You can buy Very Pink for £1.99 at Superdrug and as Impulse is widely stocked, I doubt it'd be hard to track this down and give this fragrance a try for yourself. Not only do they have the fragrance out, but they've also teamed up with Lipsy to create a very pink limited edition dress only available on the Lipsy website! You can get £10 off it too with the voucher code VERYPINK. Have any of you tried this fragrance yet?